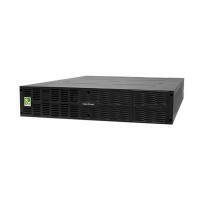 CyberPower BPE48V75ART2U is an Extended Battery Module (EBM) which can be used in conjunction with compatible UPS systems to provide prolonged system runtime during power interruption. The battery module comes with DC plug-and-play power connectors to allow for adding multiple EBMs. With the built-in charger design, the EBMs can charge directly from utility without resorting to UPS, significantly saving total charging time when charging multiple EBMs. The sealed lead-acid battery used within the EBM is stable and safe, which ensures the power system's reliable performance. Designed with industrial-grade metal enclosure, the product is suitable for data center and critical applications.